Historic New England’s Quincy House in Quincy, Massachusetts, recently welcomed a fascinating artifact as part of its interior restoration project. In early May, a rare early nineteenth-century Chinese ivory pagoda arrived to act as a stand-in for the Quincy family’s pagoda, which is now in the collection of the Metropolitan Museum of Art in New York City. The Quincys’ pagoda appears in c. 1880s photographs of the interior of the house. Eliza Susan Quincy described it in an 1879 memorandum that documents the family’s furnishings. According to Miss Quincy, the pagoda came into the family in 1792 and moved along with them to several of their Boston homes before finally arriving at their home in Quincy in 1876. She explains how complicated it was to move the pagoda from one place to another. Our collection services staff concurs. Above you see two people removing the pagoda from the truck and placing it on a modern platform. The tall metal rod is an armature that the structure will be secured to so that it cannot tip within the case. We reproduced the Quincys’ original glass case, which is also at the Met. In the interest of safety, the pagoda and case traveled separately in the truck. Together they were too tall to be assembled inside the house, so they had to be brought together outside on the truck’s lift. See a slide show of the delivery and installation. 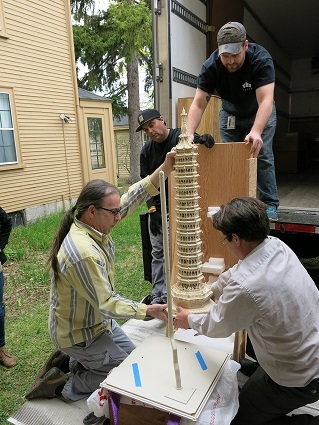 Visit Quincy House this summer to see the pagoda in its permanent position in the East Parlor. Historic New England Members: Enjoy three exclusive opportunities to see the newly restored Quincy House. Sunday, May 31, 1:00 to 3:00 p.m.